I decided to spare my house last night and cooked dinner outside. I forgot that that meant I would be standing in front of a hot grill in 30+ degrees in 70+ humidity for the duration of the cooking. It did make the rosé taste particularly good. I have a women's night out this evening at Sushiro (YAY! ), so my meal plan this week includes ample leftovers so I don't have to cook for the boys tonight. Last night I made Ziti with Grilled Gazpacho Sauce and Sausage, using kamut spaghetti instead of ziti, since that's what I had. It's an amazing dish—with one small word of warning. It says it serves 4, and our family of four usually manages to eat an entire recipe that states it makes four servings, because we eat a lot. We barely ate half of what this recipe produced. Which suits my purposes, so I'm not complaining. But whatever you do, don't double the recipe if you have six guests. There will be more than enough. 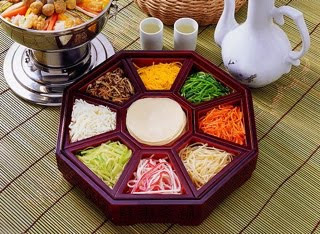 To feed my long lost friends tomorrow, I've decided to do a nice hot weather dish of Kujolpan, a make it yourself dish of pancakes and eight fillings. I have the plate for it, and it's fun to use. 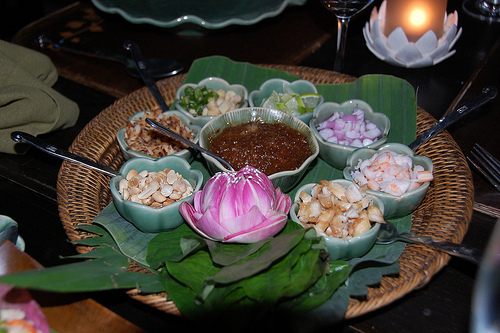 I'm also going to serve Miang Kam, Thai lettuce wraps with fresh fillings. I'll save the heavy stuff for dessert when I make my favourite Thai sticky rice pudding with fruit. I said I wasn't going to cook today, but it may be wise for me to get started on some of the fillings today. They're very simple, but do require some chopping and prepping, so it would be good to get them out of the way so that there's more time for visiting tomorrow.